Meditation: Just how important is it? The art and skill of meditation is the single most important thing you can learn to do in any one lifetime. It is literally the key to every door and the answer to every question that exists. Turning inward and becoming a student of yourself, is by far the best way to find your way in this lifetime. There is nothing that cannot be achieved through a consistent healthy practice of meditative thought. Some meditate and actually have visions of their god or higher self, receive applicable information for guiding their lives, find peace, and find spiritual enlightenment of various forms. 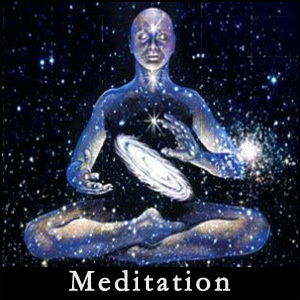 Meditation can lead us to our spirit guides, animal guides, our higher self, the source, etc. Many people are aware of the importance of meditation, but might not know exactly how to go forward with it. This is the purpose for this page and the following links. I am offering you the opportunity to choose a suitable meditative practice that works with your lifestyle, whatever it may be. So, please keep in mind that when you are choosing a specific style of meditation, choose one that you resonate with. Choose one that makes sense to you. By doing so, you will open doors to your mind that you never thought possible. Keep your mind open as to what you expect to be successful in your first several attempts at meditation - that is if you are intending to reach a deep, altered state of consciousness. For some, It may take a little time to achieve what you want. Try not be discouraged, just keep practicing. You will be better focused over time. Good luck with your new adventures.